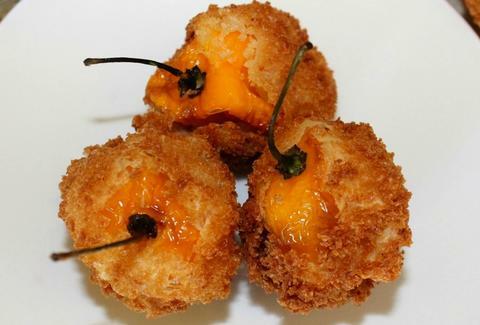 The chef who brought us the comforts of mac & cheese burritos has revealed her sadistic side in the form of fried habanero poppers, a snack that might be the go-to app in the bar outside the 7th Circle of Hell. Each of the peppers gets stuffed with cream cheese and shredded cheddar, then coated in a batter of seasoning and Panko. They're then fried and served with ranch/bleu cheese and, presumably, a pint of Pepto. Remember, habaneros are no slouch on Scoville, so attempt only if you're a confirmed spice junkie. Kristin Hunt is a food/drink staff writer, and is way too much of a wimp to eat these. Follow her to safer spices at @kristin_hunt.